Election season is underway and we've had a few people asking for more information on voting dates, poll locations, and who the candidates are. 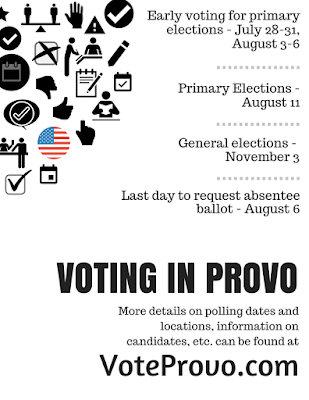 Provo City has a website with the information you need as well as links to the Utah County Election Office where you can request an absentee ballot. Several neighborhoods are hosting "Meet the Candidate" nights. Watch the calendar for one in your area. The Mayor's blog has also provided videotaped interviews of candidates.